Kate Bailey is a highly qualified and specialised Occupational Therapist with 30 years of experience in the field of Paediatrics. Kate graduated from UCT with a BSc degree in Occupational Therapy in 1985. After a year of travel and working in the field of Geriatrics in Burnley General Hospital, England, Kate returned to Cape Town, South Africa where she discovered her passion for children at Red Cross War Memorial Children’s Hospital, working in the areas of burns and learning disabilities. Kate then moved to Johannesburg and joined a Paediatric Private Practice, working with children with learning challenges. During this time she continued her studies at WITS University for another 6 years of part-time studies. She attained her qualification in Sensory Integration Therapy (1989) and an Adv. Dip. OT in Neurosciences (1991) and a MSc OT (1993). 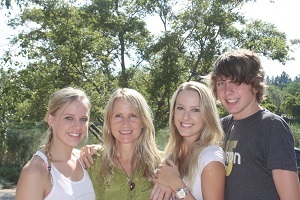 In 1991 when her first daughter, Lara, was born, Kate started her own Paediatric Private Practice in Fourways, together with Occupational and Physiotherapy colleagues. At that time, she was working mostly with pre-school and primary-school children with Sensory Integration Disorders, Learning Disabilities, Autism, Syndromes, Cerebral Palsy and Developmental Delay. With the birth of her second daughter, Jenna in 1995, Kate discovered her deeper purpose in partnering parents and families in working with their babies, toddlers and young children. She added Neurodevelopmental Therapy to her repertoire of knowledge by doing the Basic Paediatric Course in NDT (2000) and the NDT Baby Treatment Course (2003). This equipped her with knowledge and skills to work with toddlers and babies. Kate presently works with babies, toddlers and young children who are at risk due to Prematurity, Developmental delay, Syndromes, Sensory Regulatory Disorders, Sensory Integration Disorders, Neurological Disorders, Cerebral Palsy, Cortical Visual Impairment and Autistic Spectrum Disorders. Kate experienced her own challenges when her son, Ross, was born 4 weeks premature and spent 2 weeks in the Neonatal Intensive Care Unit. This together with her passion for early intervention initiated her research and development of the Dvd series “Making Sense of My World”. In this series, Kate demonstrates the milestones of development and provides parents with fun, easy to do activities to stimulate sensory and motor development in the first year of a baby’s life. Through her experience and learning, Kate believes in the importance of early stimulation as a means of increasing learning potential as well as preventing problems early in a child’s life when early intervention can still have an influence on development. The focus of Kate’s work is to empower parents by giving them the tools to become actively involved in their child’s development. From her research, experience and work in completing the “Making Sense of My World” series, Kate joined Physiotherapist, Nicky Lasch and together they wrote the Moms and Babes Stimulation Programme. Moms and Babes Workshop is part of the Moms and Tots Franchise group owned by Petra Lester. Kate and Nicky train the franchisees in the theory of sensory, motor, cognitive, play and emotional development in babies from 0 to 12 months. They also teach practical handling and stimulation of all the milestones, using fun activities that enhance caregiver-baby bonding. This two-day training programme equips the franchisees to run their own mother-baby workshops to support parents understand and enhance their babies development. The privilege Kate feels in travelling the unique journey with each parent and child, has taken her on her own path of learning. She branched out to study intuitive and emotional healing techniques to complement her practice. She studied to be a Journey Practitioner with Brandon Bays (2004-2005) and a Bodytalk Practitioner, completing modules 1,2,3,4,6,7 (2006 – 2010). As the mother of three beautiful, bright and loving children, Kate believes that parents play the most important role in the growth, development and emotional wellbeing of their children.As a result, Kate studied the DIR/Floortime technique developed by Psychiatrist, Stanley Greenspan. She has completed both the Basic and Fellows online courses through Profectum Academy in New Jersey, USA, to gain her certificate in DIR/Floortime. This technique focuses on the communication and relationship between caregiver and child, considers sensory processing differences in each child, and stimulates the emotional developmental capacities in children. With 27 years of experience, numerous postgraduate qualifications and a true passion for her work with children and families, Kate has begun the journey of sharing her knowledge and experience with other professionals. In 2012, she developed the workshop “Working with the Younger Child: Assessment and Treatment of the 0 to 4 year old”. Kate’s workshops incorporate video case studies to offer other therapists the opportunity to share and develop their knowledge and handling abilities further. She is at present designing a second workshop for those who want to work with babies. Kate’s love for working with other Occupational Therapists and sharing her knowledge and experience, has spurred her present passion for mentoring. Therapists who want to develop their skills further, can work in Kate’s practice under her supervision, or merely observe Kate at work and spend time discussing their observations and clinical reasoning thereafter. Kate is also running monthly groups where therapists can bring case studies to discuss. She believes that it is through teaching others that she is continuing to gain deeper insights and knowledge.